Amir Soltani is an Iranian-American writer, journalist and human rights activist who has worked in business, media, nonprofits and philanthropy. His graphic novel, Zahra’s Paradise, has become a global multi-media phenomenon. The story of a mother and blogger’s search for Mehdi, a student who has vanished in the aftermath of Iran’s presidential elections, Zahra’s Paradise has made publishing history as a real-time online graphic novel that appears in fifteen languages. It has been covered by dozens of news outlets including the Economist, the New York Times, Der Spiegel, BBC, Jakarta Times and others. Amir serves as the executive producer and co-director of DOGTOWN REDEMPTION. What he brings to this project is the conceptual powers and gifts of the storyteller, the passion of the human rights activist and the skills of the community builder. Amir studied social and intellectual history at Tufts and Harvard. Chihiro Wimbush is the co-director and co-producer of DOGTOWN REDEMPTION. One of eight filmmakers to win a BAVC fellowship, Chihiro is the son of a British father and Japanese mother. Chihiro grew up in Rhode Island and attended Columbia University. After several years work in nonprofit organizations, and as a musician, radio host, and teacher (homeless youth in San Francisco and English in Hiroshima, Japan) Chihiro chose to bring his interest in film to the foreground four years ago. Chihiro has helped produce narrative feature films for Wayne Wang, Rich Wong and HP Mendoza, while directing, shooting and editing short documentaries with K Pacific Production partner Jim Choi. He has also served as cameraman for Mike Siv’s upcoming documentary feature on Cambodian baseball. He has written, directed and edited narrative short films which have screened at film festivals around North America from Vancouver, Canada to Austin, Texas. He is also the writer, director, editor and producer of Innerworld, a new video adventure game and series for the iPhone and iPad. Manuel has been an editor for twenty years. His experience ranges from documentaries and commercials, to music videos and magazine style programming. Some of his recent projects include The Storm that Swept Mexico, Writ Writer, A Dream in Doubt, and China Blue. Manuel was also a contributing Editor on the critically acclaimed mini documentary series Life 360, a co-venture between ABC/Nightline and PBS. Denise Zmekhol’s international career as a producer and director spans the globe from Brazil, Europe, Africa and Asia to the United States. Originally from Sao Paulo, Brazil and now a resident of the San Francisco Bay area, award-winning producer-director Zmekhol has created innovative commercials, feature documentaries, transmedia projects for non-profits, and her own independent productions including her award-winning feature documentary, Children of the Amazon. Her directing career emphasizes humor, passion, empathy, attention to detail, simplicity, clarity, and elegance. Her work has been recognized for a strong visual style, story-telling orientation combined with her ability to collaborate with people in four languages — English, Portuguese, French, and Spanish. Ray Telles’ 35 year career in film and television includes the production of documentaries and news magazine segments. He has produced and directed for Public Television,Turning Point and Nightline-ABC, Dateline- NBC, Latino Public Broadcasting (LPB) and Channel 4, U.K. His independent productions include films for the National Endowment for the Arts (NEA), the National Endowment for the Humanities (NEH), and the Independent Television Service (ITVS). Ray has produced and directed more than 30 documentaries, winning numerous awards including three Emmy Awards, two PBS Programming Awards for News and Current Affairs, the Ohio State Award, an ALMA Award, the Dupont Columbia Gold Baton and others. Zachary Stickney is a graduate of Weber State University, where he received a B.S. in Political Science and Philosophy and was selected as the Outstanding Graduate in Political Science. While attending Weber, Zach was selected as a Presidential Scholar, a Horatio Alger Association Scholar, and a Richard Richards Institute Scholar. In 2011, he received the University’s Outstanding Volunteer Service Award for his work with campus organizations and for his volunteer work in the internally displaced persons camps in Maai Mahiu, Kenya. In the same year, he also received the departmental best paper award for his thesis on Iran’s 2009 election protests. Upon graduation, he was a finalist for Weber’s scholar of the year award. Zach enjoys basketball, hiking, and singing karaoke badly. 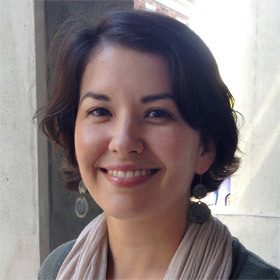 A Bay Area transplant from Honolulu, Hawai‘i, Lauren Kawana received a master’s degree in documentary film at UC Berkeley’s Graduate School of Journalism in 2014 and went on to work as associate producer and outreach coordinator on Mind/Game: The Unquiet Journey of Chamique Holdsclaw with director and producer Rick Goldsmith. She is excited to share the powerful stories of DOGTOWN REDEMPTION with local and national audiences to foster greater compassion and shift personal perceptions and prejudices. She is focused on creating partnerships that will help us rethink how we support our most vulnerable communities. Sage has worked in documentary post-production for 13 years, mainly as an assistant editor, associate producer, and archival researcher. He has contributed to such projects as the Emmy Award-winning series Have You Heard From Johannesburg and the Peabody Award-winning film Soft Vengeance: Albie Sachs and the New South Africa.